Built on the FT principle these quality mowers are interchangeable cassette systems with one minute changeover giving options to fit 8 different heads including scarifiers, verticutters, brushes, spikers, slitters as well as 6 or 8 bladed cutter cassettes. Available as 26" (66cm), 30" (76cm) and 34"(86cm) widths. The G660/G760/G860 are easy and comfortable to operate. The handlebar console houses the controls - throttle, park brake, switches and cutter clutch. Only the forward drive handle needs to be held in by the operator. This reduces operator fatigue and with the built in electrical interlocks makes the machine ultra safe to use. The handlebar design makes manoeuvring easy and the wide adjustment makes it comfortable for all heights. High quality Sheffield steel cylinder and bottom blade with six blades in opposed spiral format to throw the grass evenly into the box. Adjustment of bottom blade to cylinder easy and positive with single spanner. Large diameter front roller with adjustable scraper for precise height of cut control. Easy to adjust on both sides of machine with single spanner. Storage unit suitable for 4 cassettes. For moss and debris removal and use as a light scarifier for final pre-cut preparation. Over the years, we've asked our contributors to tell us what their favourite piece of kit is. 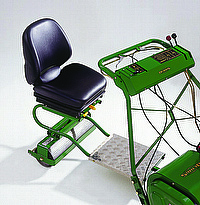 The most popular has been the Dennis G860. The G860 stood out because of its versatility and ease of use. 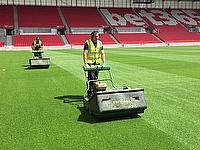 Glenn Davies, grounds manager at Bloxham School in Oxfordshire has claimed that he chooses Dennis because of the “strength, history, quality and durability” of the mowers.